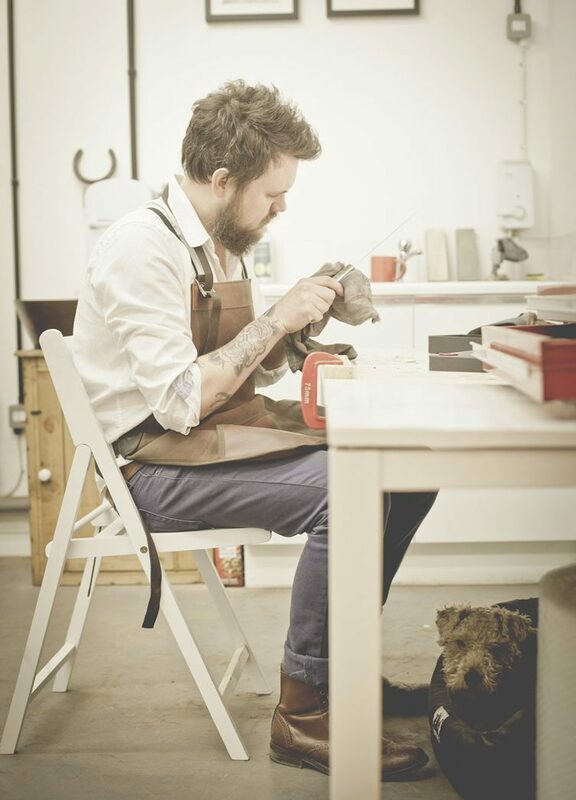 Graphic designer Ben Edmonds is one of the new breed of artisan makers who are bringing passion, originality and quality back to the fore. 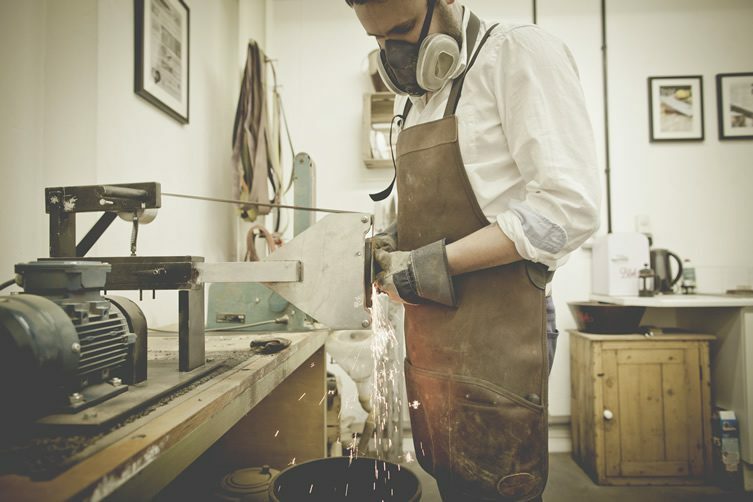 Design-led craftspeople may have been offering discerning consumers that something different for some time now, but places like Portland or Brooklyn would perhaps be first on most’s lips as that something’s source – not the heart of Derbyshire. Thinking topically, as Thatcher cast her spell upon Britain’s steel industry in the late-1980s, it would have been almost inconceivable that an artisan in the country’s heartlands would be producing finely crafted chefs’ knives in the 21st century – but, thankfully, that’s exactly what Edmonds is doing, and with some flair. 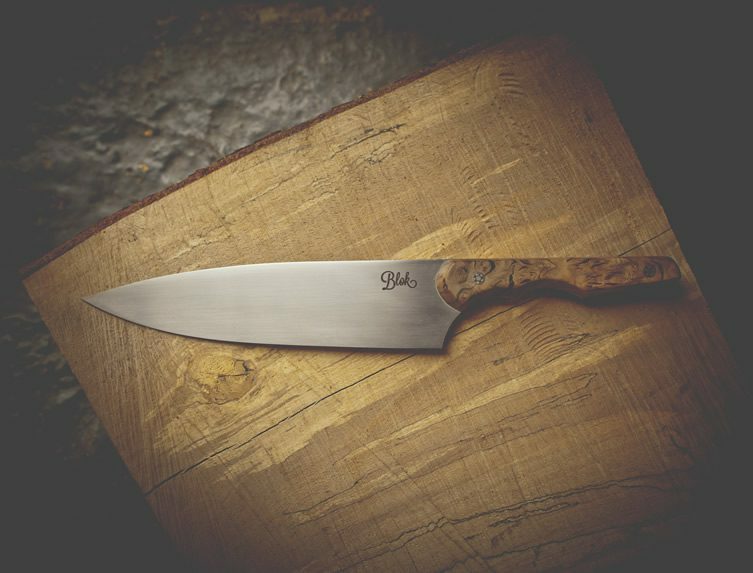 Edmonds’ desire to use British materials wherever possible is standard practice for modern, sustainable makers; yet there’s nothing standard about Blok Knives – the designer’s debut release is a meaty multi-purpose kitchen knife available in both Stainless and Carbon Steel blades, the latter’s natural patina in harmonious unison with the characterful English Burr Oak of the handle. 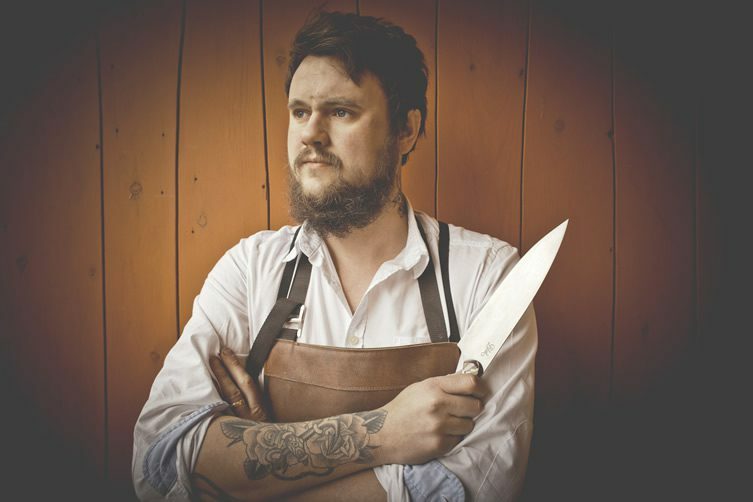 These are blades for hefty chunks of meat, preferably self-caught – there’s a ‘no messing’ aesthetic to Edmonds’ work, no matter how beautiful the end product is. 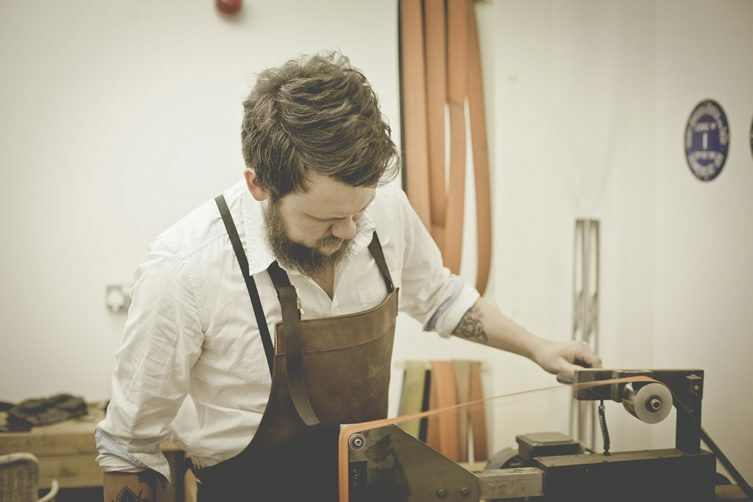 Ben, can you tell us a little about yourself – how did you find yourself making knives in a basement in Derby? I’ve always enjoyed a challenge. I like trying new things, things I’ve not done before, things I know nothing about. A few years ago my wife and I decided to remove the TV from our house. 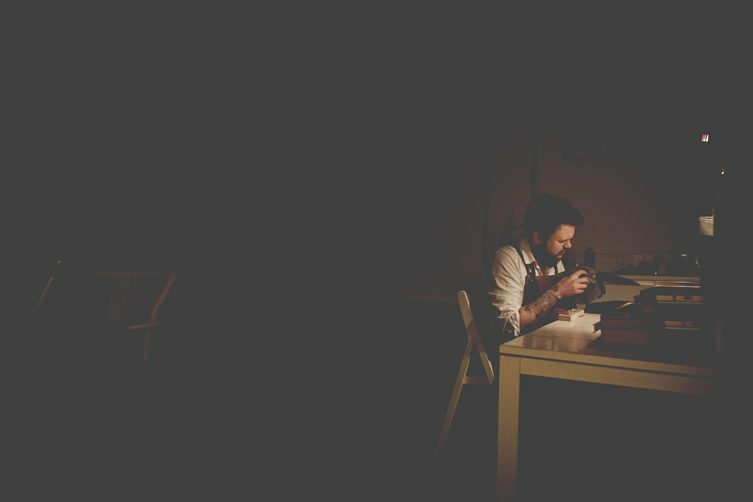 This instantly boosted creativity and productivity for both of us. We found that we had more time to dedicate to the things we loved doing. One saturday afternoon whilst browsing YouTube (we didn’t boycott all modern technology) I stumbled upon a teenager making a knife from an old wood file in his dads garage. It didn’t seem to complicated. If he could do it, so could I! Well, that was that. I ordered some cheap steel, purchased some tools and set to work. 40 hours of hand filing and sanding later, I had my very first knife. It was rough around the edges, not that straight and generally a bit scrappy, but I loved it. There where however, things I would have done differently, improvements to be made. With these in mind I started on another knife. I’ve not stopped since. Before I knew it I was all set up in the basement surrounded by machinery and metal. I was becoming a knife maker. 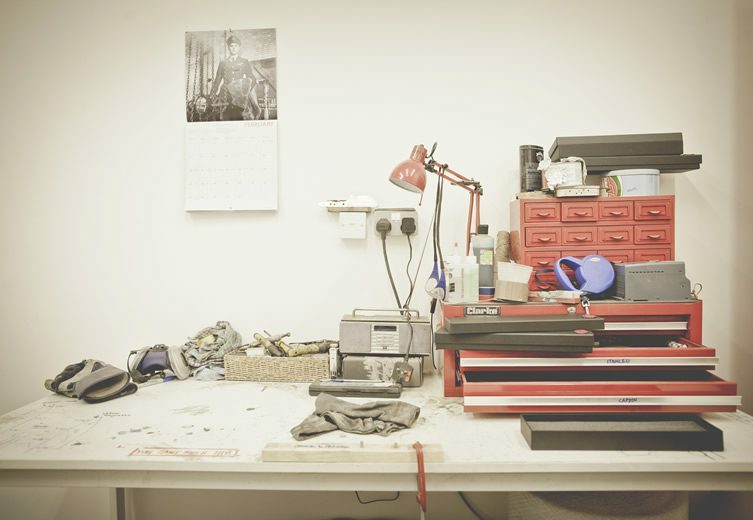 As of December you’ve moved to a new workshop – how is that going to change what you can achieve with Blok Knives? Blok was never intentional. It only became a serious consideration when someone wanted to buy one of my knives. Before I knew it I had orders, this then meant I was thinking about a name, packaging, website and all the other things that come along with setting up a business. I very quickly out grew my basement space. It was cramped, damp and dark, not the best knife making conditions. Being slightly too tall for the height of the ceiling didn’t exactly help either. I had to move. My new workshop is light, spacious, surround by other makers and has the added bonus of a normal sized ceiling. I no longer have to worry about waking the neighbors when I fire up the grinder at sunrise. It’s nice to have a place dedicated to knife making. I’m much more productive now. When Im there I can give it my full attention. You design and craft these knives that are a little like a barely-tamed but ultimately beautiful beast, can you tell us a little about your design inspirations? I’ve always been inspired by old things, the traditional techniques and types of materials used to make them. Although I use modern machinery during my making process I wanted to keep some traditional elements. The handle material is an English Burr Oak. Wooden handles seem to be so much more tactile than plastic composites. I know I’m not re-inventing the wheel here but I wanted to strike a balance between new and old, making sure that the quality of finish, ease of use and attention to detail are always top of the list. ￼Was it a case of trial and error in the early days – any major injuries along the way? I’d be lying if I said I haven’t scared myself a few times. I approached this with no previous experience in the world of grinders and metal, it was all very new to me in the early days. So yes, there was a great deal of trial and error. Mostly error, but thats how you learn. Naturally, when making a knife, you get a few cuts and burns. You just learn to expect it. There have been occasions when moving machine parts have been hurled at me but to this day, touch wood, I’m still here fully intact. What length of time are we looking at for the making of each knife? This can vary with each knife. Averaged out I would say around 9 hours. The majority of this time is spend at the grinder removing metal. Some days you have ‘bad knife making days’. When these strike its best just to down tools and head for some paper work. You’re working on some other knives to accompany the signature chef’s knife – how’s that coming along? I’m very close. It took the best part of a year to develop the chef knife; trial and error, tweaking and then testing. My new designs, a paring and cheese knife, have been through the same process. I have been very carful about the styles of knife I choose to make. I want to stick with a few styles and do them well, rather than spreading myself too thinly. 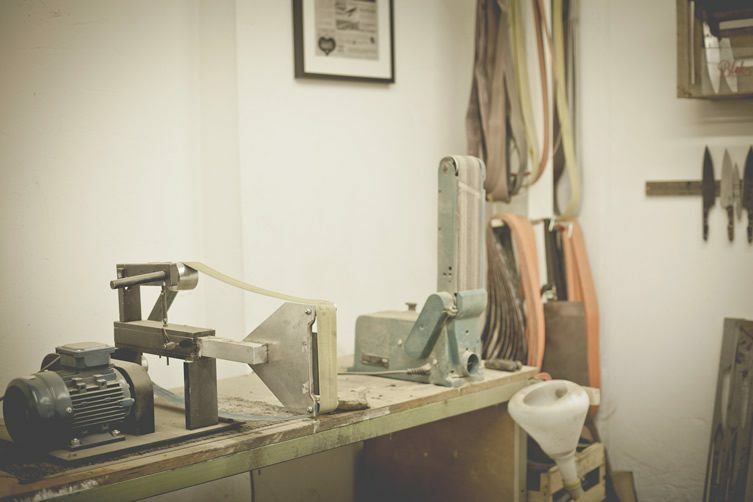 There’s a big international resurgence in artisan industries – what do you think is making today’s consumer more aware of small run makers and designers? In short, I think more people are starting to care. I love what I do and want this to reflect in my product and in the quality of service I provide. This is the same for all makers I know. Consumers are becoming more and more interested in the processes and materials used in the products they buy, meaning they would spend more time researching before had. I find myself regularly chatting to people about the options they have when ordering a knife. I think this is all part of the process that these ‘new wave’ of consumers enjoy. I’m interested in your use of carbon steel – it lends the pieces a real rugged look, did you start with this or did you add it as an option afterwards? I began making my knives with a high grade stainless steel, 440C (I still make 440C Knives now). The Carbon followed shortly after. I wanted to give people the option. The rugged look comes from the ‘patina’ which I force onto the metal to give the blade a protective coating. This helps prevent rust on the Carbon steel and creates incredible patterns and colors making each knife totally unique. 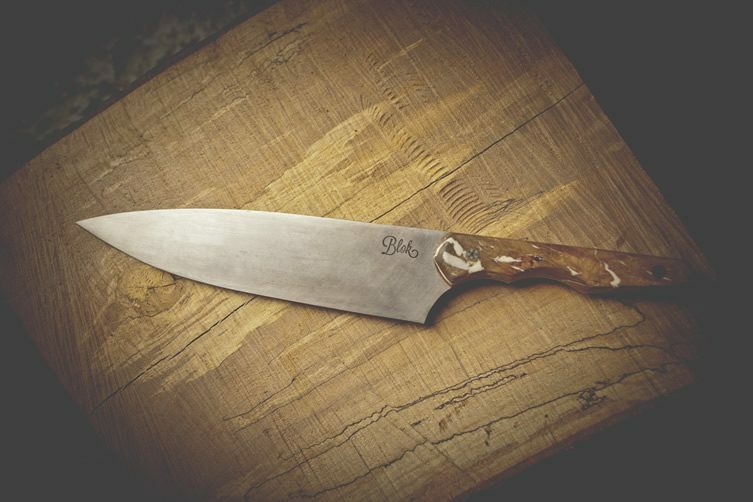 Naturally, a Carbon Steel will hold a slightly sharper edge than a stainless, it just needs a little more looking after. The Carbon seems to be a very popular choice at the moment. If you could choose one chef to prepare you a meal using your own steel, who would that be? I had to think long and hard about this. If you’re only giving me one chef I’d choose René Redzepi. He runs a restaurant called Noma in Copenhagen. They produce some of the finest looking dishes I have every seen. Dishes that require some tremendous knife skills and intricate slicing. I’m assuming I would be eating the dish after, so that’s another reason I’ve chosen René. What music soundtracks the making of a Blok Knife? I couldn’t possibly pick one song. Each knife has its ups and downs, as does each day. When grinding is going well something nice and drum heavy, Fast paced and energetic; The Who or maybe The Maccabees. Then on the flip side of that the finishing touches require more relaxing music along the lines of Nick Drake or Ryan Adams. I want to keep learning new skills and developing my craft. This will come with more and more practice. I’m also going to be teaching knife skills classes at C4’s Fabulous Baker Brothers Cooking School. It’s been great fun working with Tom and Henry developing the course, it’s one thing to own a sharp knife, it’s another thing to know how to use and look after it. I’ll also be holding half day workshops at the School in Chipping Sodbury.